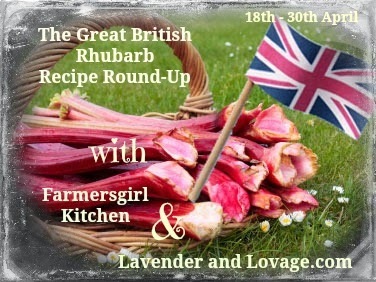 The Great British Rhubarb Recipe Round Up Linky Party opened on Saturday and is proving very popular. I'm not quite sure why we have such an affection for these acidic pink stems. I can only imagine that it is because they are the first 'fruit' of the year and a harbinger of spring. There is a local rhubarb connection here in the south west of Scotland as James Mounsey, a Scot who had been the doctor to Tsar Peter III, fled for his life back to Dumfriesshire when the Tsar was assassinated. He brought rhubarb seeds with him and from these he successfully grew fields of high quality rhubarb. The house he fled to is only about half a mile from where I live, so it is perhaps, not so surprising that our rhubarb is prolific and that our plants must be nearly 50 years old. Lay a sheet of filo pastry on to a baking sheet covered with baking paper, brush with melted butter and sprinkle over a little caster sugar. Cover with another 3 sheets of filo, each brushed with butter and sprinkled with sugar, press down. Bake at 160C for 8-10 minutes until golden brown, leave on the tray for a few minutes, then transfer to a cooling tray until cold. 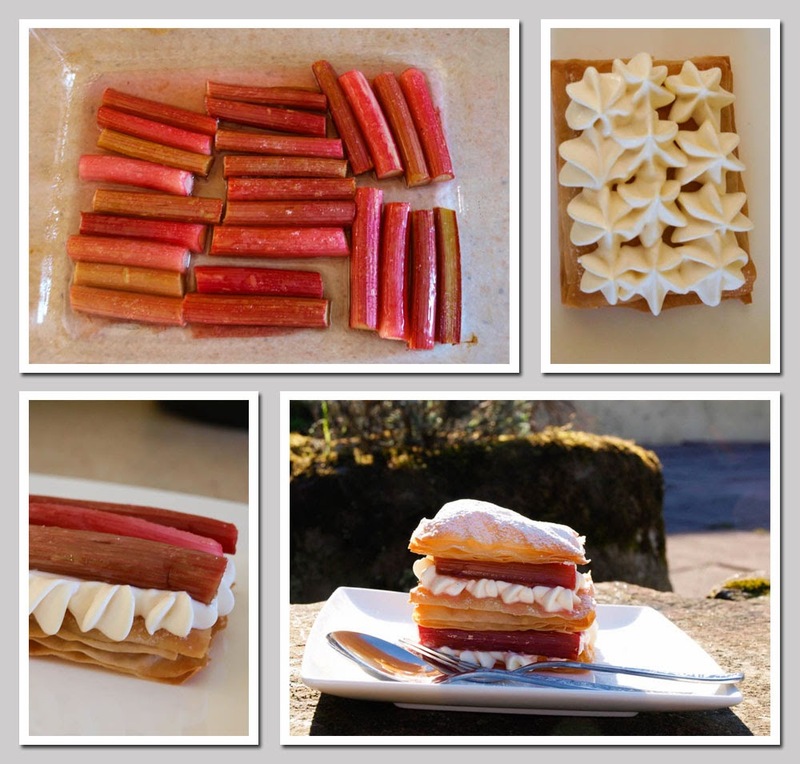 Measure the length of the pastry rectangles, then cut your rhubarb into lengths to match. You will need 24 lengths of rhubarb (6 for each portion). Place the rhubarb into a baking dish and sprinkle over the remaining sugar (75g), roast the rhubarb in the oven at 160C for around 12 minutes or until you can easily pierce the stalks with a knife but before the rhubarb starts to disintegrate. Remove and leave to cool. Whip the double cream and until very thick and stiff, fold in the custard and load the mixture into a piping bag with a large star nozzle (Wilton 1M). Place the pastry rectangles onto the serving plates, pipe cream in three rows, place three stalks of rhubarb on top, then place another pastry on top and repeat the cream and rhubarb. Top with the final pastry rectangle and dust with icing sugar. I hope you will join me and Karen from Lavender and Lovage by sharing your rhubarb recipes and enjoying the inspiration of the great entries we have already received. Thank you Helen. 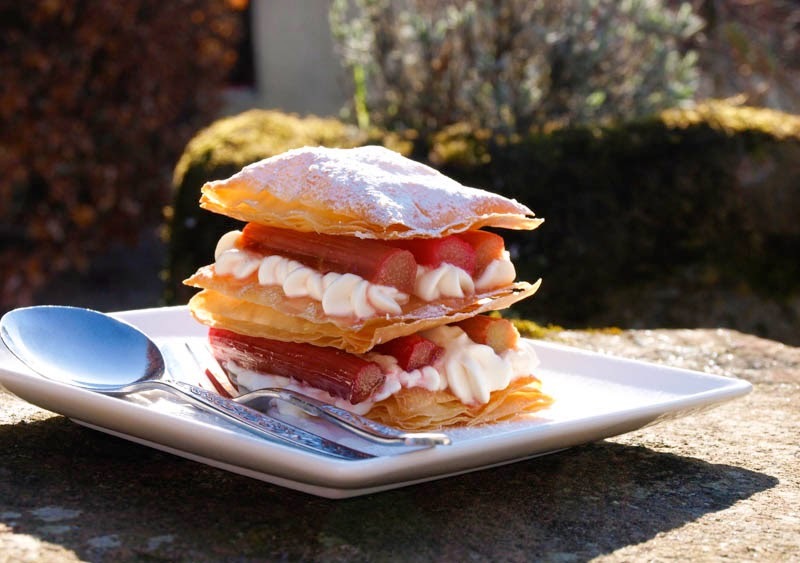 It is fun to see all the recipes come in and I really enjoyed making the millefeuille, I'm sure you could whip one up for Mr C! Thanks Karen. Roasting the whole stalks really helps with the presentation of rhubarb, you just have to get the timing right! Works better with thin young stems. OMG, I would love to have this right now! How beautiful is that dessert! And the rhubarb puts it over the top for me! Great recipe, Janice!! Yummy! Thanks Christina, it was fun to think up the recipe, easy to make and even better to eat! This is the prettiest thing I've seen on Facebook today! Very clever idea using filo, too. Well done, Janice! I love rhubarb and I so pleased to see ours coming forth from their winter slumber. This looks absolutely delicious and definitely one for a lovely sunny lunchtime or supper. I have to confess I do love to stew some of my crop and make rhubarb Margaritas. Janice, I so just want to dig in to that. It looks really, really good. This is one of my favorite desserts/cake but I have never tried it with rhubarb. It works really well with rhubarb roasted like this, Nanya. Give it a try.